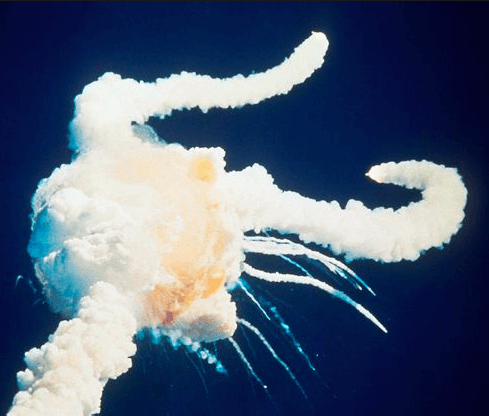 On this day in 1986, the Challenger space shuttle broke apart 73 seconds into its flight and plunged into the Atlantic Ocean. All seven of the Challenger astronauts, who had blasted off from Florida’s Kennedy Space Center, perished. One of the crew members, Christa McAuliffe, had won a nationwide NASA competition to be the first schoolteacher to go to space. —POLITICO. 28 Jan 2015 in Education, History, Science. ← Associate Dean of What? Yep…it was a snow day from school and my sisters had their 6 month check up at the doctors that day. My mom and grandma were getting them ready when I saw it on tv! I was at home for snow day too! My 4th grade science teacher had applied to be the teacher on board so I remember screaming when it happened!!! I was in Mr. Guerin’s AP History class. They summoned us to the library where the library nun had a tv. I suspect you were in the library at some point that day, too. Sad day. I was with Jim DeMarco in the library but it was my AP biology class. I didn’t remember that there were multiple classes there but I do remember the day. In the library with Jim DeMarco and Molly Keogh Mayer. Remember it all too well. i didn’t see it live. we didn’t have tv’s in our classrooms. I was in second grade. But i saw it on the news over and over and over. I would think i saw pieces of bodies falling from the sky in the footage. It was a lot for a young mind to handle. I remember saying a rosary in Miss Milligan’s religion class once we got there. I wanted to become a teacher so I could go into outer space like Christa McAuliffe. I was in art class, but I can’t remember sister’s name…Helen maybe? It was so shocking, the room was silent.